Which Favorite Snack has 35 Ingredients? There is a snack that earns Frito-Lay around $600 million a year. The multiple flavors of this chip and colors of the packages are incredibly enticing. With 35 ingredients, they are truly a food engineering miracle. We know them as Doritos. What exactly is a Dorito? Some would say it is a "food-like" substance. Check out Micheal Pollan's book on the subject at the end of this post. 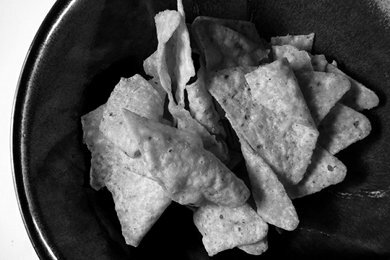 With upward of 35 ingredients, including such things as MSG and artificial colors, a Dorito is a manufacturing miracle. When you bite into one - are you really tasting food? Try them up against some Cheese and Crackers or just Potato Chips. Perhaps your own taste test will lead you to the conclusion that Doritos belong in outer space. The other big issue with Doritos is the serving size. In one package of Doritos, you get just over 2 ounces which is 310 calories. One ounce (11 chips) is equal to 150 calories. Frito-Lay list one serving as 1 ounce on the package - but who can eat just half a package? Would you like an order of fat with your burger? Ah, Doritos, my weak spot. This is where I put my 'everything in moderation' practice into play. Wow. This is seriously scary news Snack Girl. Thanks for pointing this out. I actually don't feel that bad for eating a few potato chips now and then. They've got very few ingredients, but I had never stopped to really examine the Doritos ingredients since those make it to my mouth faster than I can read. Sigh. I doubt that my children would pick an apple over Doritos, but I use my apple slicer and then slice each apple slice into 3 thinner slices. For some reason my kids love them this way! I did this mainly for my 2 year old who has a hard time eating the bigger slices. My children also like peanut butter on apple slices and, as I mentioned in another post, Peanut Butter & Co. Dark Chocolate Peanut Butter (available at Wal-mart) helps with chocolate cravings and is super yummy on apples and bananas!